Everyone will be afraid to come up to your haunted house with the SWINGING SKELETAL BOY DOLL around! 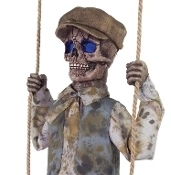 The Swinging Skeleton Boy Animated Prop features a Victorian era vintage style outfit, and just wants someone to play with. Won’t you stay just a little while longer? He promises not to hurt you... Much! This creepy prop features an infra-red sensor, hollowed out eyes that glow an other-worldly blue, and speaks haunting phrases to all passersby with such an innocent voice, as his rotating head turns side-to-side while he swings back and forth. -’’One, two, I'm a comin' for you, Three, four, breaking down your door, Five, six, beware of my tricks, Seven, eight, you will not escape, Nine, ten, this will never end! (Giggle)’’.